Cecile Kiener (our Principal Osteopath) established her first Osteopathic Clinic in the Medway region in 1991. Our Medway Osteopathic Clinic is situated in Chatham. We also run clinics in Ashford and Dover. Explore our drop down menu or visit our home page to find out more about osteopathy and the numerous conditions we can treat. Cecile Kiener graduated from Medway’s European School of Osteopathy (ESO) in Maidstone, Kent. An exponent of both structural and cranial osteopathy, she runs a regular practice in Chatham Medway. Cecile is also a a qualified acupuncturist and is affiliated to Zita West the world renowned fertility expert. Discover more about Cecile and our other practitioners by clicking on the About Touch2Heal link. Osteopathy is an excellent therapy for treating a wide range of ailments and conditions. Although bad backs are in “constant supply”, osteopathy is ideal for such diverse conditions as migraine, arthritis and even some dental problems. Our osteopaths at Touch2Heal adopt an holistic approach to your treatment. By that we mean we treat you as a whole person and not just your symptoms. See how osteopathy can help you. 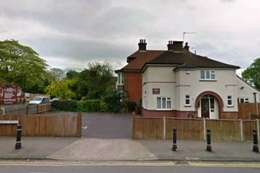 Our Medway Osteopathic treatment room is situated within The Mason Clinic which is opposite the Texaco petrol station on the corner of Maidstone Road and Cornwallis Avenue in Chatham. Our site has ample free parking and the clinic itself offers disabled parking and wheelchair access. To discover more about our clinic, location and fees please click on the Chatham Osteopathic Clinic link. Our practitioners run regular osteopathy and acupuncture clinics in Chatham, Ashford and Dover, Kent. To book an appointment at our Medway Osteopathic Clinic simply call 01634 842583 or alternatively you can email us at enquiries@touch2heal.co.uk. I suffered a small head on collision in the snow last winter. I felt okay after the accident but the following morning my neck was really sore. My wife suggested seeing Cecile at Touch2Heal. She fitted me in the next day (Friday) and I had a second session the following Tuesday. The first treatment helped me no end and two days after the follow up session the pain disappeared completely. I had gone through all kinds of medical treatment for my fibromyalgia. I felt totally exhausted and without hope until I met Cecile. Since she started treating me I feel my life is back on track and I’ve even re-started playing in the orchestra I belonged to a few years ago. I manage to slip my disc just getting my laptop bag out of the back of my car. The pain was excruciating and went down the back of my left leg as well. Apparently I had trapped my Sciatic nerve. Cecile was able to work the area to reduce the pressure on the nerve which made a huge difference. I used Cecile the first time I was pregnant and she cured my morning sickness problem in no time. As soon as I knew I was pregnant the second time I booked myself straight in to see her. I didn’t experience any morning sickness throughout my pregnancy.